The effects of biochar properties on crop growth are little understood. Therefore, biochar was produced from eight feedstocks and pyrolyzed at four temperatures (300°C, 400°C, 500°C, 600°C) using slow pyrolysis. Corn was grown for 46 days in a greenhouse pot trial on a temperate and moderately fertile Alfisol amended with the biochar at application rates of 0.0%, 0.2%, 0.5%, 2.0%, and 7.0% (w/w) (equivalent to 0.0, 2.6, 6.5, 26, and 91 t biochar ha−1) and full recommended fertilization. 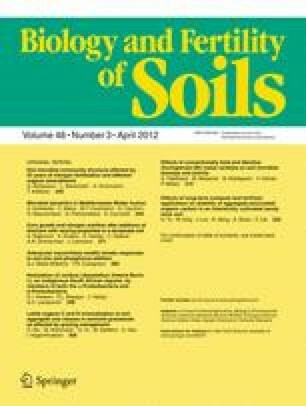 Animal manure biochars increased biomass by up to 43% and corn stover biochar by up to 30%, while food waste biochar decreased biomass by up to 92% in relation to similarly fertilized controls (all P < 0.05). Increasing the pyrolysis temperature from 300°C to 600°C decreased the negative effect of food waste as well as paper sludge biochars. On average, plant growth was the highest with additions of biochar produced at a pyrolysis temperature of 500°C (P < 0.05), but feedstock type caused eight times more variation in growth than pyrolysis temperature. Biochar application rates above 2.0% (w/w) (equivalent to 26 t ha−1) did generally not improve corn growth and rather decreased growth when biochars produced from dairy manure, paper sludge, or food waste were applied. Crop N uptake was 15% greater than the fully fertilized control (P < 0.05, average at 300°C) at a biochar application rate of 0.2% but decreased with greater application to 16% below the N uptake of the control at an application rate of 7%. Volatile matter or ash content in biochar did not correlate with crop growth or N uptake (P > 0.05), and greater pH had only a weak positive relationship with growth at intermediate application rates. Greater nutrient contents (N, P, K, Mg) improved growth at low application rates of 0.2% and 0.5%, but Na reduced growth at high application rates of 2.0% and 7.0% in the studied fertile Alfisol. The online version of this article (doi: 10.1007/s00374-011-0624-7) contains supplementary material, which is available to authorized users. We appreciate the support by the Cornell Presidential Scholarship to S.R., by the New York State Energy Research and Development Authority (NYSERDA Agreement 9891), by the USDA Hatch grant, and partial support by the National Science Foundation’s Basic Research for Enabling Agricultural Development (NSF-BREAD grant number IOS-0965336). Any opinions, findings, and conclusions or recommendations expressed in this material are those of the authors and do not necessarily reflect the views of the donors. We thank Elena Miller-ter-Kuile for the help in conducting the experiment; several individuals who allowed us to conduct experiments with their biochars, specifically Michael Antal, BEST Energies, Akwasi Boateng, Sergio Capareda, Chee Chia, Dynamotive, Bob Hawkins, Stephen Joseph, and Jerome Matthews; and several anonymous referees for their valuable comments.